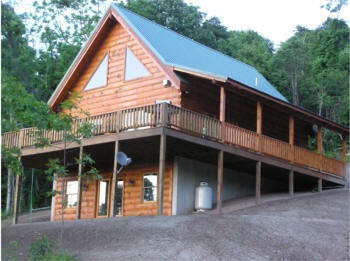 Autumn View Log chalet is one of our most private new log cabins. Its setting is ideal. No major roads close by, which means no traffic noise, listen to the wind blow gently thru the trees. The cabin is bordered by over 500 acres of woodland of which is then border by the Shenandoah National Park. In fact a short hike from the cabin you will find a nice set of waterfalls. Sit on the covered porch and enjoy the great views. Watch the sun set over the distance mountains. You have true peace and quiet here. Remember when you were a child and use to rock on the porch of your grandmothers house and listen to the rain coming down on her metal roof? We put a nice green metal roof on the cabin just for that reason. We put a lot of windows in the cabin, so there is loads of natural light that comes in, while inside, you get the feeling your are one with the outdoors. On the deck, relax in the top of the line hot tub. It has 78 jets, its own waterfall, LED lights, and even a built-in radio, CD player with pop-up speakers. It is truly an awesome experience. Time to cook? Grill out on the stainless steel grill while taking in the scenery around you, what a nice way to vacation. Inside the Autumn View Log chalet offers 2 bedrooms with queen size pillow top beds and 2 baths. A 2 person Jacuzzi is nooked in a corner of the master bedroom for those long awaited romantic evenings. The kitchen offers stainless steel appliances with dishwasher, along with all cookware, dishware, utensils and pots and pans. It has nice hickory cabinets with plenty of storage, and beautiful granite counter tops. A top of the line cabin. The great room has exposed post and beams, its ceiling soars to 24 feet. The rock fireplace is the main focal point, it reaches to over 10 feet. Snuggle up to it on those cool days, enjoy our comfortable sofas along with each other. The great room also has a big screen LCD TV with a DVD player, and a satellite dish for clear reception. Rest assure the cabins are clean. We clean them ourselves. We are small owners of vacation cabins and we take pride in keeping them in shape. Whether you want to getaway and relax or you have a romantic weekend in mind or a full vacation, then the Autumn View Log chalet is perfect for you. We also offer in-cabin massages. Ask about pricing and details. Please contact the with comments about this site. Copyright © 2003-2016 - Rustic Cabin Rentals and Mountain Lodging Vacation Cabin Rentals. Text, graphics, and HTML code for this site are protected by US and International Copyright Laws, and excluding Internet search engines and directories, may not be copied, reprinted, published, translated, hosted, or otherwise distributed by any means without permission.